After a four-week hiatus, the Verizon IndyCar Series roars back to life in the desert. What used to be Phoenix International Raceway is now called ISM Raceway. What does ISM stand for? Ingenuity Sun Media, of course. If that doesn’t evoke fond racing memories, I’m not sure what will. The new name notwithstanding, IndyCar has a very rich history at Phoenix. AJ Foyt won the first Indy car race held at the D-shaped oval back in 1964. Of course, Foyt won all but three races in the thirteen race 1964 season so that shouldn’t be a huge shock. In those days, the USAC Championship made two stops each year in Phoenix – generally at the beginning and end of the season. Lloyd Ruby won the season-ending race in 1964, long after Foyt had wrapped up the championship. Sadly, top-driver Bobby Marshman lost his life after a crash at Phoenix while tire testing there in late November of 1964 – just a few days after the race. Some of the biggest names in racing have won at Phoenix. Aside from the aforementioned Foyt and Ruby; names like Don Branson, Jim McElreath, Mario Andretti, Gary Bettenhausen, Al Unser, Swede Savage, Bobby Unser, Gordon Johncock, Johnny Rutherford, Tom Sneva, Rick Mears, Bobby Rahal, Michael Andretti, Arie Luyendyk, Emerson Fittipaldi, Helio Castroneves, Tony Kanaan and also the immortal name of Jim Guthrie – they’ve all won at Phoenix. All kidding aside; except for Guthrie – that’s a very impressive list that reads like a Who’s Who of Indy car racing. Phoenix was reconfigured in 2010, mostly to handle the much heavier stock cars that prefer higher banking. The front straightaway was widened and the banking was slightly increased and converted to progressive banking. This will be the last time the track looks the way it does now. Next year, the seating will be completely different and the start/finish line will be between Turn One and the dogleg which is in what is currently called the backstretch. By moving the start/finish line, the numbering of the turns will be different as well. But the biggest question looming over this weekend is whether or not IndyCar will even be back next year. This is the third year that IndyCar has returned to the 1.022 mile oval in the desert. If I’m not mistaken, the current contract was a three-year deal. Track owner, ISC – a sister company to NASCAR, has a history of not being patient while IndyCar tries to build attendance at some of their tracks. Watkins Glen and Fontana have given IndyCar two chances at their tracks and the plug was recently pulled for the second time at both tracks. If this weekend’s race is poorly attended, will that be it for Phoenix? If so, it hardly seems fair. The date has been juggled since the series returned in 2016. It was early April two years ago, then due to the Final Four being in Phoenix last year, it was moved to later in the month. This year it returns to what is hoped to be a new traditional slot for many years to come. But in order for that to happen, attendance must improve. For attendance to improve, fans need to be given a reason to come out. Quite frankly, the last two races at Phoenix have not given fans a reason to come out or return. To be kind, they have been snoozers. To be blunt, they have been stinkers. The previous car in the aero kit era had so many wings and winglets all over them, they created a ton of turbulence in their wake. In short, it was very difficult for anyone to pass. The result was two years of boring one-mile processions. Experts last year told us that the new car would be much more racy at Phoenix. What we saw during February testing at Phoenix suggested otherwise. I’m telling myself that it was a test when everyone was trying to emerge unscathed and that the race will be much different. Let’s hope so. The Verizon IndyCar Series can’t stand another clunker at Phoenix. They need a good race that will have everyone talking just like the race at St. Petersburg did four weeks ago. If they can see at least a decent crowd tomorrow night and a good race, the series may see a fourth year in a row at Phoenix. If Saturday night’s race is a dud, this might be it at Phoenix for a while and that would be a shame. IndyCar needs to be at Phoenix. It is one of those tracks like Indianapolis and Milwaukee that is in the DNA of the series. It didn’t upset me that much when Watkins Glen fell off the schedule last year, because IndyCar doesn’t have a long history there. Since 1979, IndyCar has only run eleven races in that thirty-eight year span. Tomorrow night will be the sixty-eighth IndyCar race at ISM Raceway since 1964. That’s a lot of history at one track to not be allowed to come back after the sixty-ninth. My hope is a good race with a lot of twists and turns, to make people have to catch their breath when it’s over. One thing that might bring people out is the celebration of Mario Andretti’s last IndyCar win. It took place twenty-five years ago in 1993 at Phoenix. Part of the celebration is the car that his grandson Marco Andretti will run, will have a livery very similar to Mario’s Texaco-Havoline Newman/Haas car from 1993. 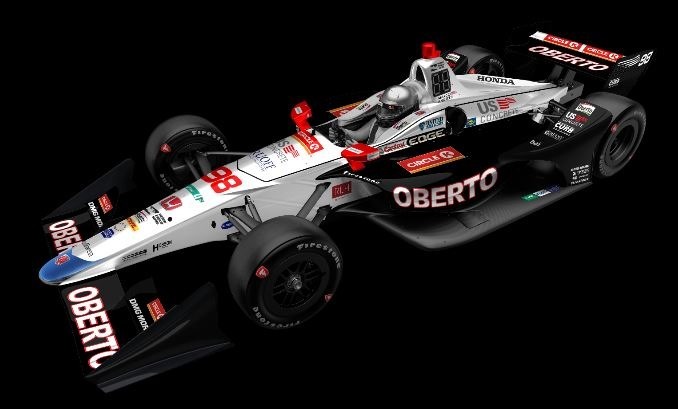 The car looks good and a tip of the hat needs to go to Marco’s sponsor Oberto. They have allowed the team to deviate from their colors and logos in order to replicate Mario’s 1993 winner as closely as possible. So who will win this sixty-ninth edition tomorrow night? Sébastien Bourdais was an early out last year at Phoenix, but that was no fault of his. Mikhail Aleshin decided to dive-bomb the field going into Turn Two. Bourdais was an innocent victim. I have to think that he’ll do well tomorrow night. My guess is that Team Penske will not stay silent two races in a row. Simon Pagenaud won here last season as Penske cars dominated the race. I’m going with last year’s season champ Josef Newgarden. He was rather quiet last month at St. Petersburg on his way to a seventh-place finish. I have an idea that Newgarden, nor his teammates, will not stay quiet two races in a row. I expect the defending series champion to come out swinging. Josef Newgarden will win the Desert Diamond West Valley Phoenix Grand Prix (that’s a mouthful) tomorrow night. After this race, things get going for real. Next weekend the series travels to Long Beach, and two weeks from now they will be at one of my favorite tracks, Barber Motorsports Park in Leeds, Alabama – just east of Birmingham. After an off-weekend, there is the open test at IMS on April 30, which I may or may not be attending. Then the Month of May kicks off on Friday May 11 for practice for the IndyCar Grand Prix. Four days of practice on the IMS oval will be followed by two days of qualifying for the Indianapolis 500. The next weekend will be the 102nd Running of the Indianapolis 500. Then the series goes to Belle Isle and Texas before earning the next break in mid-June. By then the four-week stretch we just went through with no racing will be a distant memory. After our teaser in March, I feel like IndyCar season is finally here for good. It’s about time! This entry was posted on April 6, 2018 at 4:04 am and is filed under IndyCar. You can follow any responses to this entry through the RSS 2.0 feed. You can leave a response, or trackback from your own site. Probably one of the most anticipated races of the season for me. I think this race will be a true test of the new aero kit, if it puts on a good race here it’s a strong sign they got things right. I watched the ’93 Phoenix race yesterday and there was more passing in the first 25 laps than the last two IndyCar Phoenix races combined and even though the entire field was a lap down by lap 50 every minute of the race was thrilling and exciting. We need some of that magic tomorrow night. My favorite bit of Marco’s tribute paint scheme is the use of Circle K essentially in place of K Mart. Dig those red Ks. I’m looking forward to this one if only for the mystery of how the new kit will race. I actually thought the test had a few moments where the cars looked to be racing more competitively than they did the last two years. I thought an Oberto was a good cigar. Turns out it is a good sausage. I’m looking forward to other sponsorships of this genre. I am about to become an octogenarian. It would bring me (and A.J.) a great deal of happiness to see him do well over there in the desert Saturday. It has become apparent to me that I will likely not outlast Mr. Anthony Joseph Foyt Jr. and I may get black flagged in my sleep some night. With that in mind, I attached one of those IMS grandstand seats to my Acorn Stair Lift. Then I put Led Zeppelin’s “Stairway to Heaven” on my turntable, or the sounds of a Novi or Offenhauser, and ride up to bed each night. True dat. Congrats Ron on your upcoming birthday. Just watched Quali and Mr. Foyt looks well after his bee encounter. Thank you young lady. I also watched Quali and Mr. Foyt does indeed look well. I think the race tomorrow will be very interesting and fun to watch. This is a track that Seb can do well on, so he is my pick. I watched him run away and hide from the rest of the field at the Milwaukee Mile a few years ago. Milwaukee is a track with the same degree of difficulty as Phoenix. I was thrilled for Seb. Here’s to him to have a great day out there tonight. I think it more than cool that Paul Newman’s daughter Clea will be serving as Grand Marshall for the race. My source for that is the track news site. Bryon Sperber has invited one of Paul Newman’s daughters to be the Grand Marshall for tonight’s race. That is very appropriate and just damned cool for Bryon to do that. Well, I failed to finish reading this blog post before the race in which George’s prediction was fulfilled.